Here’s a shot I grabbed of Islas Malgrats a couple of days ago. This island was the second “turning buoy” in the Distance event. We’ve just wrapped up the 2013 Port Adriano SUP Race on the beautiful island of Majorca (or “Mallorca” for the purists…). On Saturday we had the awesome Long Distance race while today it was the Sprints, with results from each combined to crown the overall winners. In the Distance Race, the battle for the Elite 12’6 victory went right right down to the line. After 12km of paddling through tricky conditions, where the water was flat one minute and bumpy the next, it was Spain’s Roman Frejo who took the win ahead of Austria’s Peter Bartl. After being in front for most of the race (and dragging along a few of his competitors in the lead draft train while he was at it), Peter fell in at the worst possible time. It was just as we were approaching the harbour and the sprint to the finish, which gave Roman a slight lead. The young Spaniard never looked back, sprinting the final 800m and crossing the line in an exhausted state, paddling the final few metres in an extreme-choke-down-sprint-stance, as if he was in an outrigger not a SUP. Meanwhile new SIC team rider Sonni Hönscheid put in a very strong performance to clinch the women’s race, defeating local favourite and Peru medallist Laura Quetglas. The Kids Sprint Race got the loudest cheer of all! On Sunday it was time for the sprints, which consisted of three short races. The first was roughly 400m, the second 300m, and the third and final sprint was a super quick, super chaotic paddle of just under 200m. After losing to Roman Frejo yesterday, Austria’s Peter Bartl had all the work to do. Results from the two races were combined, but the Distance Race acted as a tie-breaker. So if Peter got 2nd in the Distance and 1st in the Sprints, he would need Roman to do no better than 3rd on day two… and that’s exactly what happened. In each of the sprints, Roman and the two Italians, Paolo Marconi (3rd in the Distance race) and Fabrizio Gasbarro (4th in the Distance race), traded the minor placings. But in the end Paolo edged ahead when he claimed the third and final sprint, which put him on nine points overall for day two vs. Roman and Fabrizio on ten points each. So as you can see from the final rankings table below, this all meant that Peter Bartl claimed the title of 2013 Port Adriano SUP Race Champion, with Roman settling for 2nd and Paolo taking in an impressive 3rd. In the women’s race the battle came down to just two: Sonni Hönschied of Germany and Laura Quetglas, the local Mallorcan paddler (and one of the driving forces behind getting this event up and running). After taking the victory on Day One, Sonni was in a strong position to claim the overall title. Laura gave her plenty of competition in the sprints, but Sonni was able to hold off in all three of the races to make it a clean sweep. 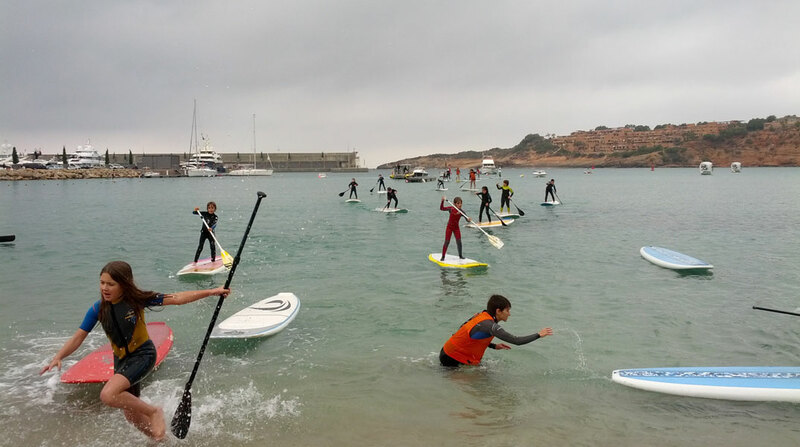 The Port Adriano SUP Race was a great event. The Distance Race enjoyed an amazing course, where a couple of very scenic islands acted as giant turning buoys. I also really enjoyed the Distance + Sprint format, where results from each day are combined to crown the overall winners. The weather gods weren’t smiling on the weekend, but I’ve been here the past two weeks and have enjoyed plenty of beautiful sunshine. Not to mention the fact that Port Adriano is a perfect spot to hold a SUP race. It’s a luxury marina that sits in a quiet part of an otherwise busy stretch of resort towns. This whole event was also very very well organised…. So when you throw in the scenic beauty of Mallorca and its reputation as a holiday island, I have doubt a lot of paddlers will be adding this one to their 2014 SUP racing calendars. I know SUPracer.com be back for sure. There were two dozen stoked grommies racing on the weekend. 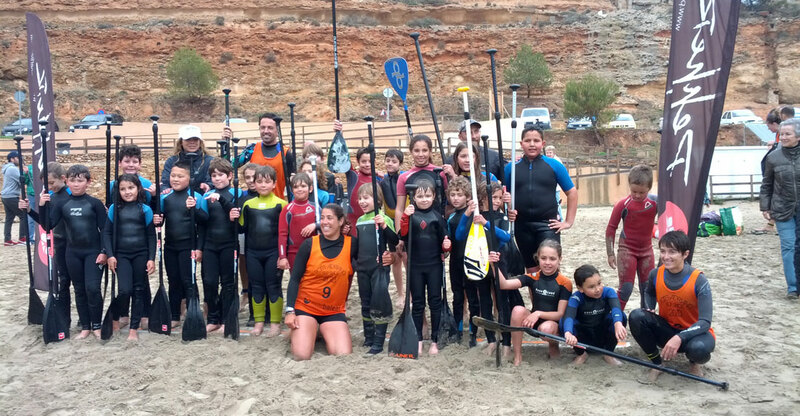 Great to see the future of SUP racing in Europe is alive and well!